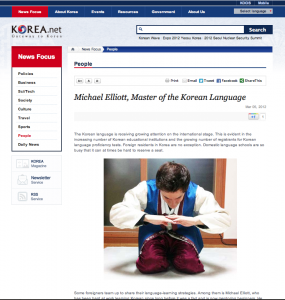 There’s an article about me up on Korea.net. I talked a lot about how I got started and what methods I used to learn Korean. Take a look if you’re interested. Clicking on the picture below will take you to the article. It’s interesting to hear that Taiwanese people have difficulty differentiating between ㅇ and ㄴ.
I always appreciate your effort. I stop by your useful website when I have time, read articles and study English. 별 오백개 드림. You look great in Korean costume. By the way, I have a question about teaching Korean. One of my Taiwanese friends(she’s been studying Korean and I am teaching her) asked me how I can tell the difference of pronuncation between 받침 ㄴ,ㅇ. I totally have no idea how to explain to her. I haven’t payed attention about it. As a Korean speaker, it’s hard to make foreigner understand it. I’ve just been able to pronounce them since I was young.